Visits of celebrities have always caused great excitement in Israel. One of the most memorable visits was that of Marlene Dietrich. During the 1960's she visited the country twice, leaving a great impression. Dietrich was born in 1901 in Germany. She rose to stardom in 1930, after her performance in The Blue Angel, directed by Josef Von Sterberg. She migrated to the United States in the 30's, and during that decade was nominated for an Academy Award for her performance in Morocco. In 1939 she became a US citizen. After 1933, attempts were made on behalf of the Nazi regime to lure Dietrich back to Germany and have her serve as the pretty face of the Third Reich. She refused. The Israeli newspaper Davar quoted her on June 1960 as saying:" From that point on, I knew that a terrible time was descending upon Germany, and that everything I had heard in the US regarding recent events in Germany was true." The Nazi regime branded Dietrich a traitor and boycotted her. When the United States joined the war against Germany, Dietrich wanted to help by doing what she did best. She performed for American and European troops at the front, sometimes even risking her life. 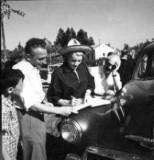 She opened her home to European expatriates, especially those from Germany and France. When the Allied forces invaded Germany she joined the American troops and reunited with her family. At the end of the war she received the Medal of Freedom from the American War Ministry, as well as similar decorations of honor from Belgium, France and Israel. 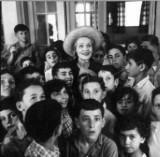 During her visit to Israel, Dietrich performed in front of German expatriates, amongst whom were many Holocaust survivors. She sang in German only after receiving the consent of the audience, because at the time, German was a language which aroused difficult memories. She also toured Yad Vashem and heard of the Nazi atrocities. 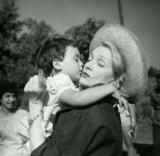 The Central Zionist Archive houses rare documentation of Dietrich's visits to Israel in 1960 - photographs, as well as press clippings in Hebrew and English, that describe her performances in front of the Israeli audience.